In 1967 Maurice and Lorraine Harvey, six years into their marriage and their overseas mission adventures, transferred from the volatile surroundings of West Africa to the relative calm of the South Pacific island nation of Fiji. With two young children in tow, it was a move closer to their home in New Zealand, but there would still be plenty of surprises as they embarked on this new phase of their lives. Writing together for this book, using their letters and diaries from the time, Maurice describes the work he undertook establishing a permanent Bible Society agency in the region, while Lorraine paints a vibrant picture of the life of a young family living in a new place and culture. 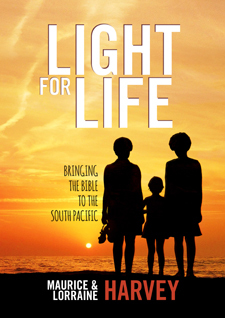 By the time Maurice and Lorraine arrived, the British and Foreign Bible Society had already been serving the people of the South Pacific for 159 years, but this book marks the 50th anniversary of the opening of the Suva office and the establishment of the Bible Society in the South Pacific.